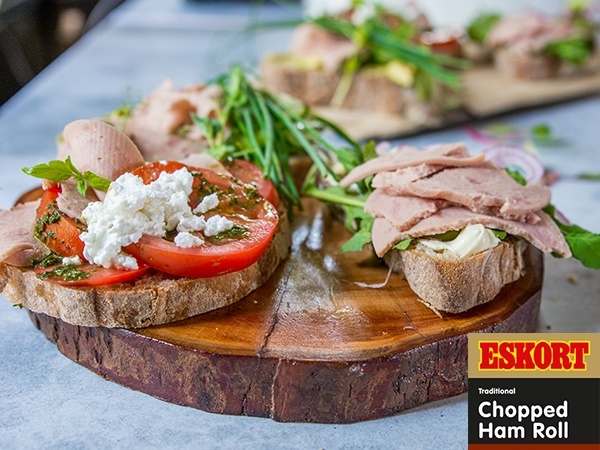 Three tasty flavour combinations take these simple, open ham sarmies to new levels of #JustDelicious! Lightly drizzle two slices of ciabatta with olive oil. Layer the ham, cucumber, avocado and chives on each ciabatta slice. Season with the lemon juice and salt and pepper. Drizzle two ciabatta slices with olive oil and toast in a hot, dry pan until golden on both sides. Marinate the tomato slices with the basil pesto, lemon juice and zest, and season with salt and pepper. Layer the ham and marinated tomatoes, finishing with the crumbled feta. Combine the mustard, cream cheese and chilli in a small mixing bowl and spread generously onto the ciabatta slices. Layer the onion and salad leaves, finishing with the ham slices.